Honor 9N is the latest smartphone from Honor which comes with Notch Display & Dual Rear Camera. Xiaomi Redmi Note 5 Pro comes with 20MP front Camera, 4000mAh battery. Check out Specs, Features, price comparsion between Xiaomi Redmi Note 5 Pro and Honor 9N smartphone. Honor 9N comes with Glass body Design and has 12 layers of glass coupled with nano coating finish in order to achieve a mirror-like effect compared to Redmi Note 5 Pro which comes with Metal body, Both Phones have curved edges on the rear. 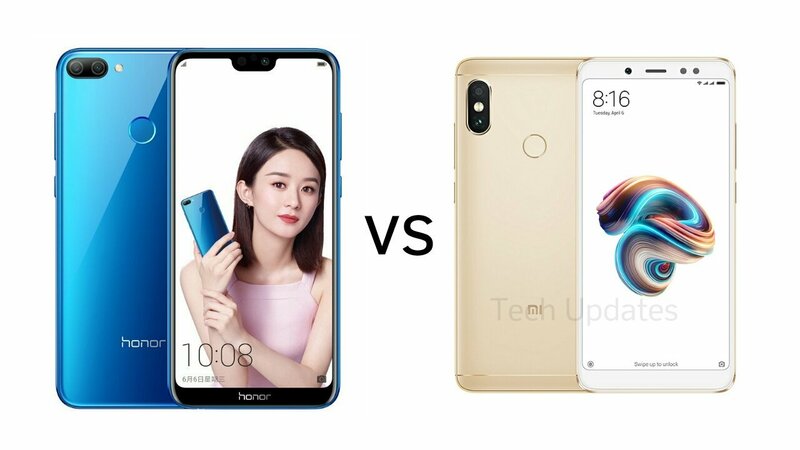 Honor 9N Measures 149.2×71.8×7.7mm and Weight: 152g whereas Note 5 Pro measures 158.6×75.4×8.05mm and Weight: 181g. Honor 9N is lighter compared to Redmi Note 5 Pro. Honor 9N comes with 5.84-inch (1080 x 2280 pixels) Full HD+ 19: 9 aspect ratio display compared to 5.99-inch (2160 × 1080 pixels) Full HD+ 18:9 display on Redmi Note 5 Pro, Honor 9N has Notch which lacks in Note 5 Pro. Both phones do not come with Gorilla Glass protection. Honor 9N is powered by Octa-Core Kirin 659 processor with MaliT830-MP2 GPU whereas Redmi Note 5 Pro comes with 1.8GHz Octa-Core Snapdragon 636 processor with Adreno 509 GPU. Honor 9N comes with 3GB RAM with 32GB Storage and 4GB RAM and 64GB/128GB of internal storage compared to 4GB/6GB RAM and 64GB Storage on Note 5 Pro both phones comes with Hybrid SIM slot. Honor has used Kirin 659 SoC in many phones now also GPU is almost 2 years old now overall Performance is better on Redmi Note 5 Pro. Honor 9N comes with a 13MP rear camera with LED flash, secondary 2MP camera and 16MP front-facing camera both front and a Rear camera can record videos up to 1080P both camera has support for depth mode. Redmi Note 5 Pro has a 12MP rear camera with dual-tone LED Flash, Sony IMX486 sensor, 1.25μm pixel size, f/2.2 aperture, PDAF, secondary 5MP camera with Samsung sensor, 1.12μm pixel size, f/2.0 aperture and 20MP front-facing camera with Sony IMX376 sensor, f/2.2 aperture, LED flash, 1080p video recording.